In Jackrabbit a Payment is considered a credit on a family account. A payment reduces the family balance. Payments should always be applied (linked) to specific fees. Fees that are not linked to a payment show a pink date paid field on a family's Transactions page. A full explanation of fee linking is provided in Jackrabbit Accounting (Linking Fees and Payments). An individual payment can be posted to a family using the Payment button which is located on every family page. Search and the List Active Families from the Families menu offer a Pay link for each family that can also be used to generate an individual payment. Both the Payment button on a family's page and the Pay links in Family > Search and List Active Families open the Payment Transaction Entry page. When opened, this page displays all of the fees that a family still owes (that have a pink date paid on their Transactions tab). Those fees may be partially paid or completely unpaid. 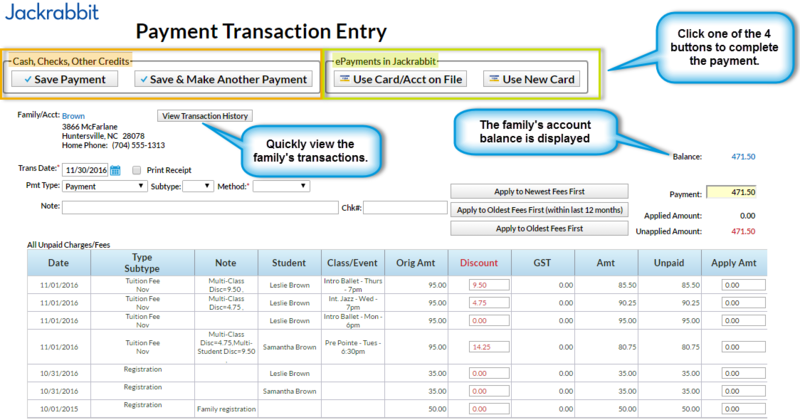 Click the Payment button in the family record or use a Pay link to open the Payment Transaction Entry page. The Trans Date defaults to the current date. If necessary, change the Trans Date. Check to Print Receipt if required. The Pmt Type defaults to Payment. This should only be changed for non-monetary payments, for example a gift certificate. See Post a Non-Monetary Credit for more information. If your organization uses Transaction Subtypes you can opt to assign a Subtype to the payment. If the customer is paying with cash or check choose a Method from the drop down list. For ePayments (credit card/bank draft) the Method is determined by the type of card or account used. Note: Setting the Method to Bank Draft, Visa, Mastercard, etc. will not process the payment as an ePayment, it will only record the transaction. Use either the Use Card/Acct on File or the Use New Card button to send an ePayment to the gateway for processing. Enter a Chk# if applicable. The Payment field will default to the family's account balance. Update the amount if the family is not paying the full balance. Click the Apply Amt column next to a fee to apply the payment to specific fees. Edit the amount if not paying the entire fee. The Applied Amount and Unapplied Amount will update for each fee selected. Click the Apply to Newest Fees First to apply the payment starting with the newest fees and working backward until the payment amount is fully applied. Click the Apply to Oldest Fees First (within last 12 months) to apply the payment starting from the oldest fees within one year and working forward until the payment amount is fully applied. Click the Apply to Oldest Fees First to apply the payment to the oldest fees first (including those beyond 1 year) and work forward until the payment amount is fully applied. Save Payment to enter the payment on the family's Transactions tab. This is generally used for check and cash payments. Save & Make Another Payment to save the payment and add another payment for the same family. Use Card/Acct on File to create an ePayment (credit card or bank account draft) using the card/bank account information stored on the family record. See Process a Single Credit Card and Process a Single Bank Account Draft for more information on processing ePayments. Use New Card to manually enter a credit card # or use a card swiper to initiate a credit card ePayment. See Process a Single Credit Card for more information. In order to process ePayments in Jackrabbit you must have a gateway and merchant account with one of our Payment Partners. If you are not set up for ePayments, you will receive an error message when you attempt to submit the transaction that states you have not activated this feature. See ePayments category for details on contacting a Payment Partner and setting up ePayments functionality.